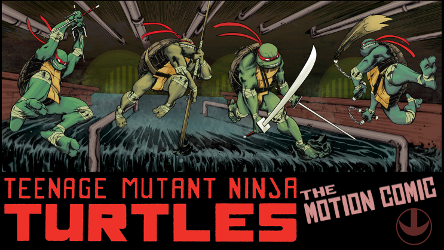 A combination of focusing on Utroms and struggling to find a comfortable turtle design for myself has led to 98% of my tmnt stuff being Utroms. Mostly fitting in its own universe, and inspired by my personal greatest question revolving around IDW Krang: "Where is his mother?" The answer I've made for myself is "she's dead". And then I ended up creating a whole character around it, which now has become a story on its own. 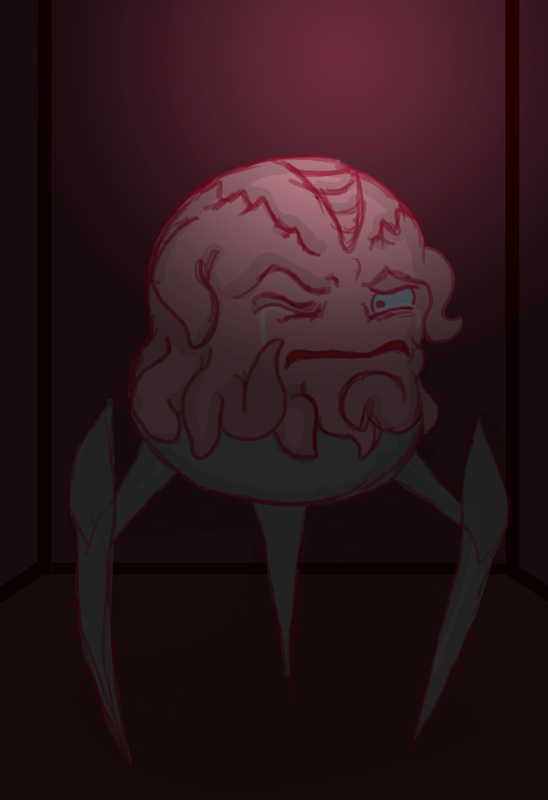 Her name was Temre and she was one of Krang's predecessors as General. She came from a large military family. Her scar comes from saving a stranded exploration team from some of the native life on Morbus; she injured fending them off, but was ultimately mortally wounded by Traxus when Krang was extremely young. One thing I really want to put together is a speculation on Utrom anatomy, which I've been struggling with for a while. It's not easy, especially considering that I'm not a professional biologist and physically could not handle dissections in high school. 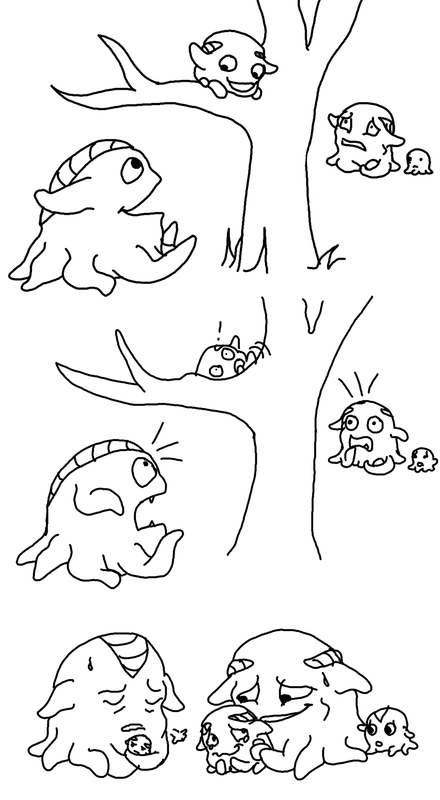 Finally for now, the (fairly old in my art development time) comic from which my icon comes from. 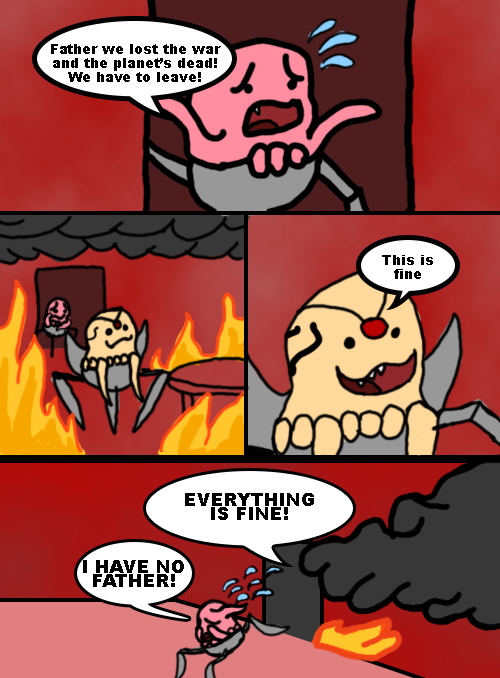 Pretty much a summary of the last time Krang saw his father. I put the pieces together and couldn't pass up the opportunity. 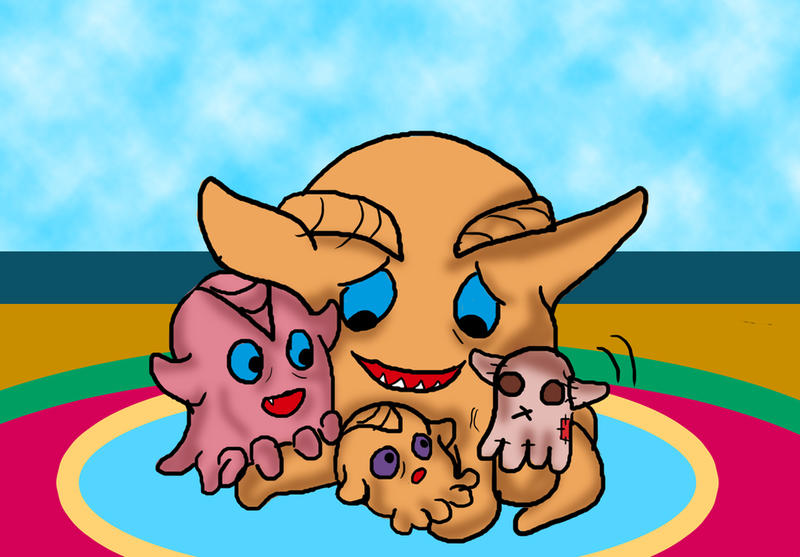 I have combined Utrom Empire, Stare Dad, and This is Fine Dog, and I am unashamed. It will probably be recreated in accordance to how I've improved in the last several months since this one. There's still a lot more I've done, but I'm not sure if they'd comply with the rules? This name is strangely familiar and i probably know who this is Finally got accepted huh? "I have seen the cost of your pride. And I have no use for it. Not anymore. I could have you forcibly removed. But you're not worth saving. You're not even worth killing." I've been drawing Utroms enough in frequency that I feel like I can revisit old art and redo it. 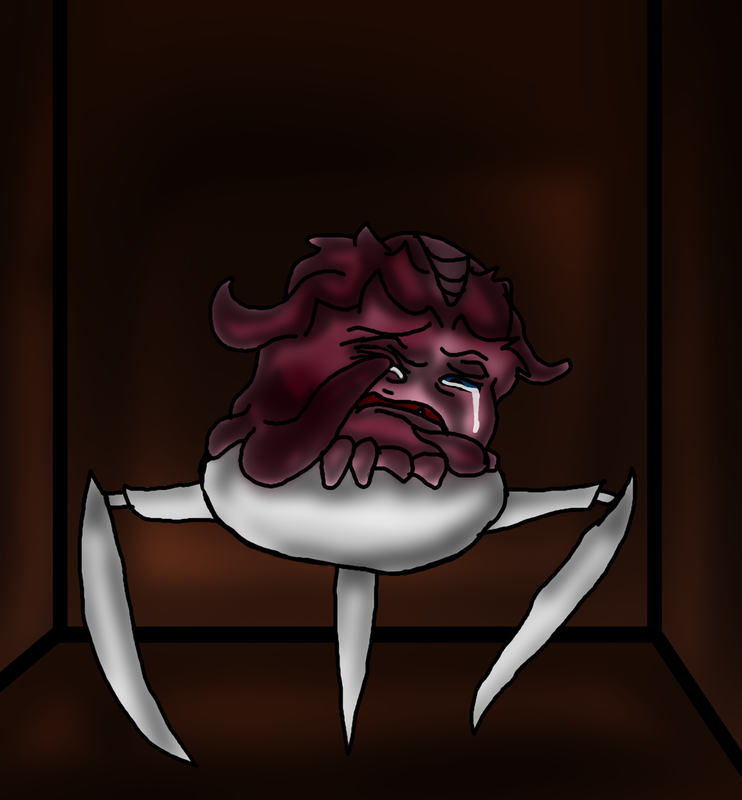 For example, a scenario while Krang is in the lift after abandoning his father to die. Now, the last remaining survivors of his species are huddled in a bunker, scrambling to prepare for their hibernation; the rest are dead as a result extermination of resources or slaughtering in the rebellion - both of which have dragged the planet into its own doom. And it's all Quanin's fault. 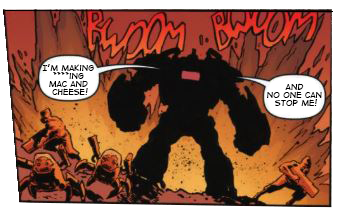 But Krang was willing to give him a chance; he's his father after all. And he had the gall to assume that they would survive on their dead planet. What's a guy to do but cry a little while he has the chance - before anyone can see and while he's in a truly isolated place? He failed his species, he failed his home and his father has fallen out of the wagon. It seems that I may have to make a third post in a row, since I have a little more to share and it's been a couple weeks since the last one. 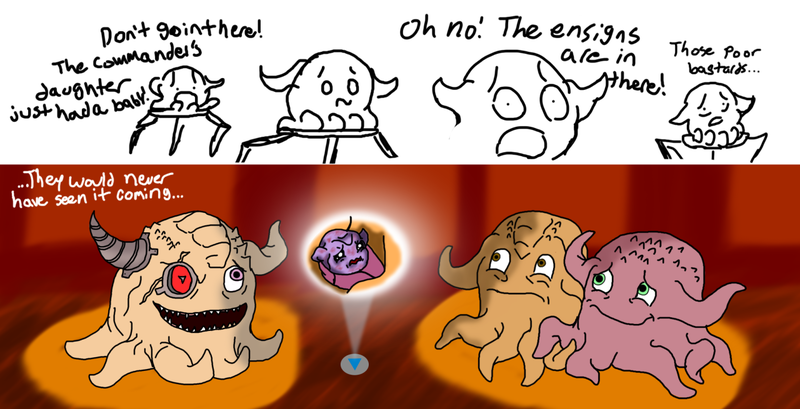 IDW Krang and Ch`rell are my favorite antagonistic Utroms, and I realized that this is would pretty much make up a highly annotated, watered down version of what a meeting between them would look like. 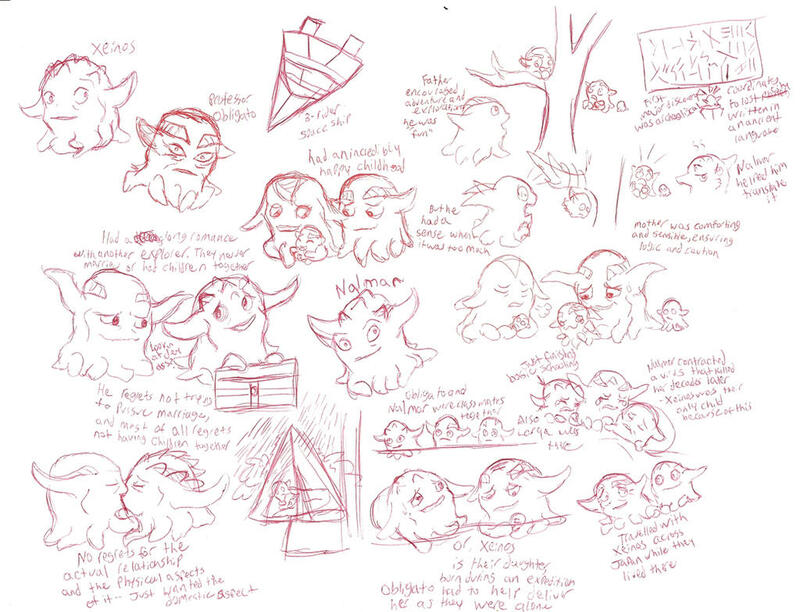 Also, it's what a quick squish not-to-be-fully finished work presently looks like for me. That's...probably not what the prongs are for, they're probably just birth defects. 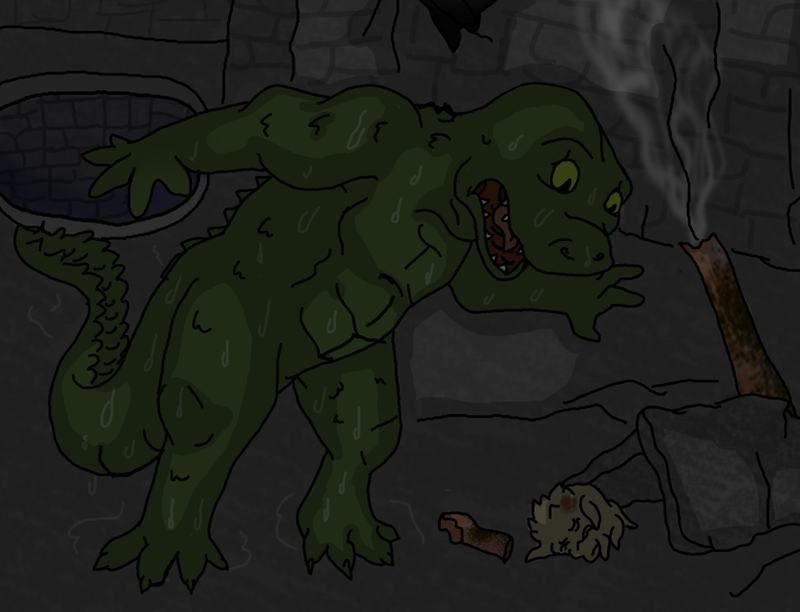 And finally, a depiction of Leatherhead finding Dr. Xeinos after TCRI was destroyed. In the basement of a building that probably needs to look a lot more gonked up. Also, I cannot draw alligator heads as well as I'd like to. It's in my concept where Leatherhead is a little older than the TMNT, though...so it was intentional to attempt making him look young. Tried to aim for a teenage boxer/wrestler look, but that'll develop in time. Last edited by Utrommaniac; 01-07-2016 at 01:56 AM. I'm hoping to get some kind of response from someone...because I have another update. 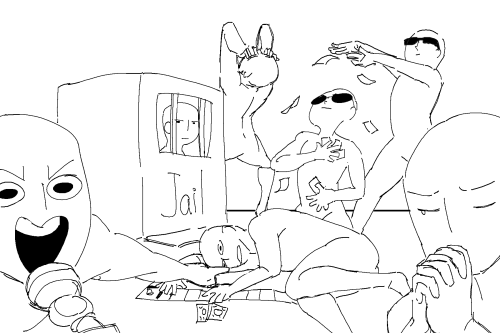 This "draw the squad" challenge inspired a "where the IDW TMNT villains are now"
I'm not actually sure what Stockman, Koya, and Blugeon are doing, but this seems pretty close. 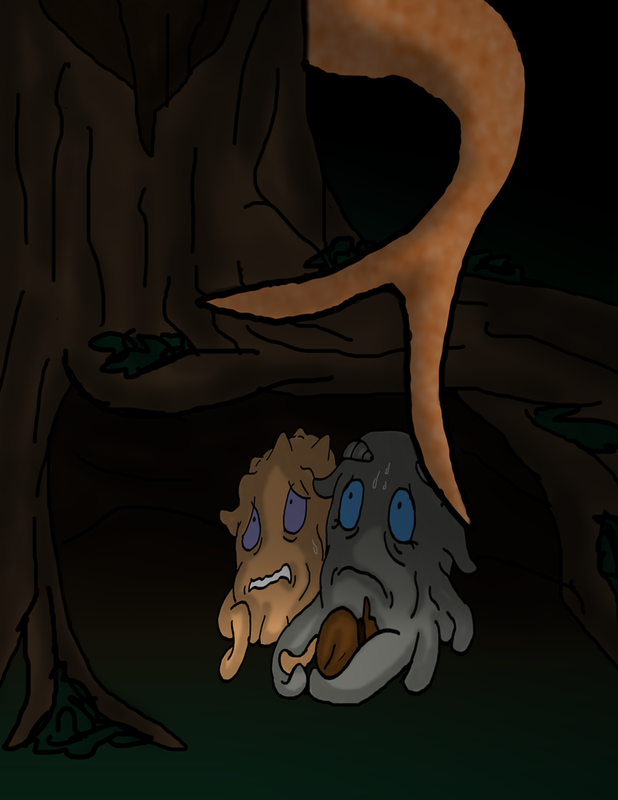 This is from September and will most likely be redrawn. But I've yet to rave here on how much I adore the Utroms that Sophie Campbell drew. Especially Churk. But he's not here. I like to think that the military transport team's commander is the type of intimidating military guy who flaunts photos of his grandchildren. Not quite sure who to compare him to? Like the eye-patched mustache-twirling villain in spy films who babies his pets. "And now that we've had our evil scheming...let's go play with my puppy." Last edited by Utrommaniac; 06-13-2017 at 09:35 PM. I never knew Utroms lead such interesting lives. You definitely are getting better. 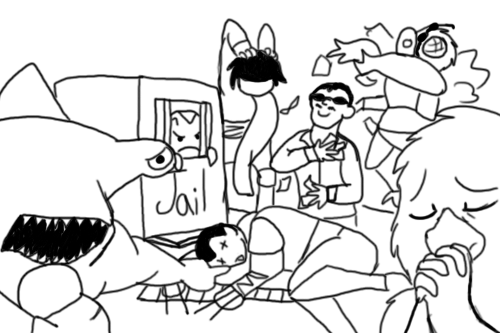 As for the "Draw the Squad" challenge, I do like your humorous take on the idea. I personally find the shading to be too intense on the original, which is part of why I did a second version; I had been experimenting with shadows that were were a little kinder to the eye. Or at least mine. 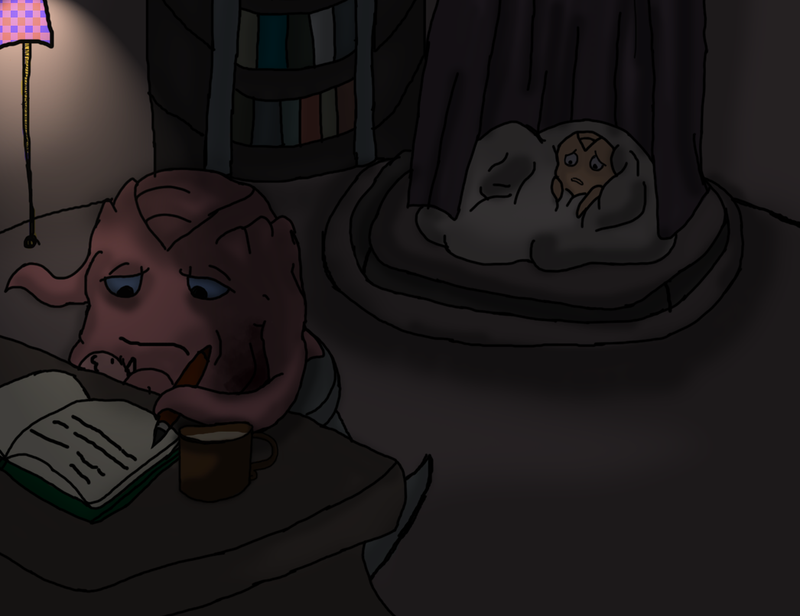 My latest redraw has been with Quanin spending a little time with Krang while his mother sleeps. I had drawn Temre handling him most of the time, and in other instances of Quanin holding him, he wasn't tolerating it. 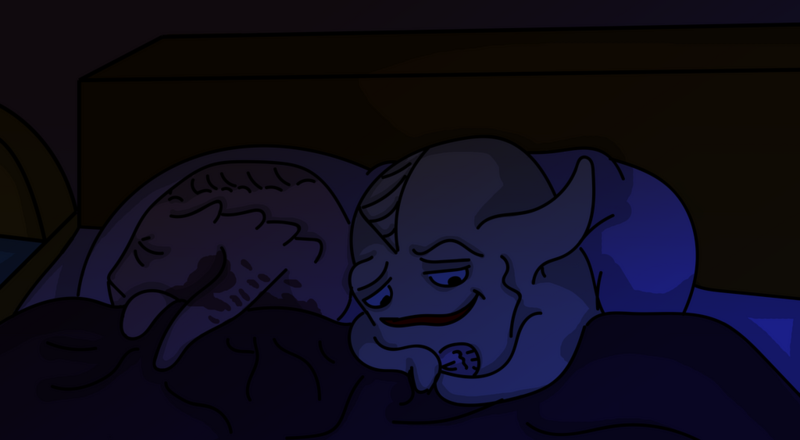 I was clueless as to how to handle Utrom sleeping arrangements, and still am, so I started off extraordinarily simple for a General and Supreme Council Member. 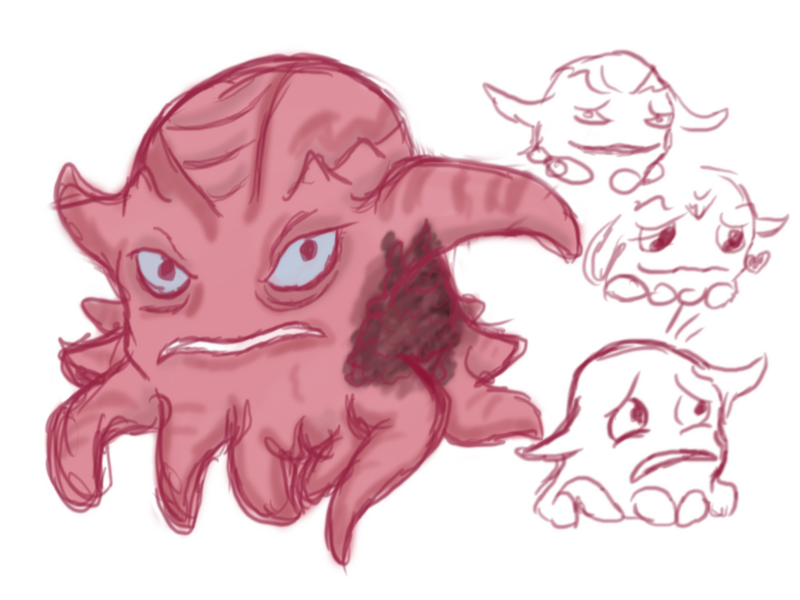 Quanin is a lot more alert, I'm still using long tentacles next to their eyes (we need an anatomy chart and come up with some actual names for their extra tentacles...and what they're used for). 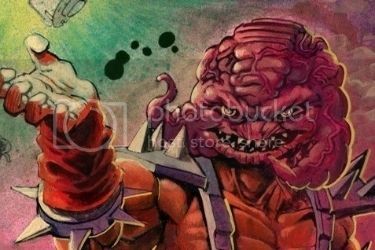 Krang is tiny, and Temre's lower jaw looks weird to me. And still no official configuration for her scars. This version has a (barely used) cradle. Look at that thing, it's huge for a baby that tiny. This time around, the bed is something of a four-poster canopy that's probably in the middle of their room. Quanin is more relaxed, and with him laying against Temre rather than against her, and with the blanket pulled up higher around them, it looks cozier. Bedding is brown instead of purple. Krang is a bit bigger, and for them, is probably cradled more properly. The cradle is absent from this version; unless they have something itty bitty, I doubt Utroms use them a lot; unless they have bassinets attached to their walkers, a concept I find adorable, but can't seem to configure. In fact, there's probably quite a lot that Utroms wouldn't share with humans, but that's something I'll get into another time. Stockman taking a money bath over Shredder's dead body... I could see that. It's been a while since a post, but I think I will go Professor Obligado themed here. Because Obligado is great. Some of these are from last November, and I ended up switching his color because it wasn't quite "right" with him...or Xeinos for that matter, who I depict as his daughter. This first one is a depiction of seeing his mother and father while his memories were being preserved, and is on my list of things to be redone. Obligado (and his father) have been switched to a gray-green color. They clearly have an awful taste in design. I like to think that Obligado had siblings, and that he was the oldest of them. He was a pretty awesome older brother. The kind that would help to make science fair projects and make them bad@$$. But for the most part, was a reliable babysitter. A page of sketches, in red ink because that was the only pen I had at the time. I was experimenting with Nalmar, his companion earlier in his adventuring career, who was also Xeinos' mother. I worked with two different ideas, one where they never had a child, and one with Xeinos. I loved the idea of Xeinos being his daughter so much that I went with that one. 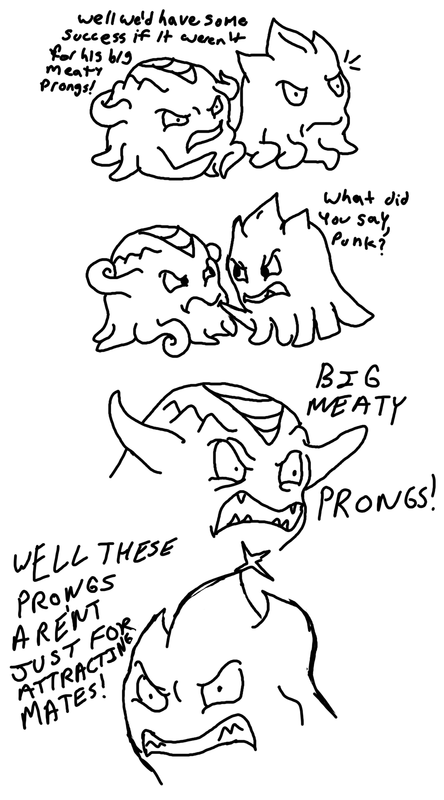 Nalmar is basically a hippie; I've coined "Primalist" as an Utrom version of it. She introduced him to a lot of the narcotics he enjoys. 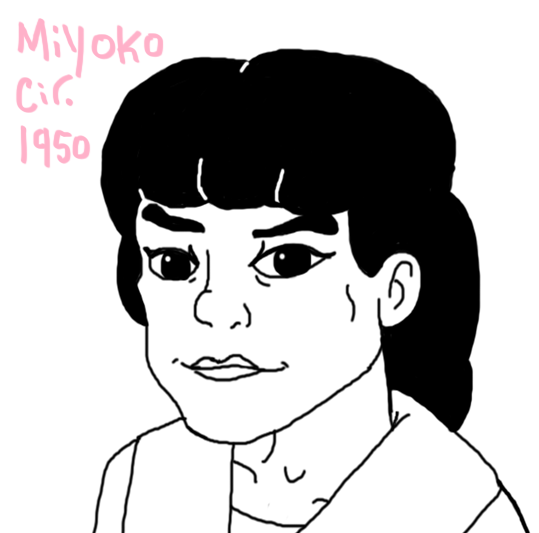 She also preceded Obligado in death decades before The Grape, having contracted a virus that is basically if Parkinson's and Hypermalaria (from Futurama) had a really ugly baby. 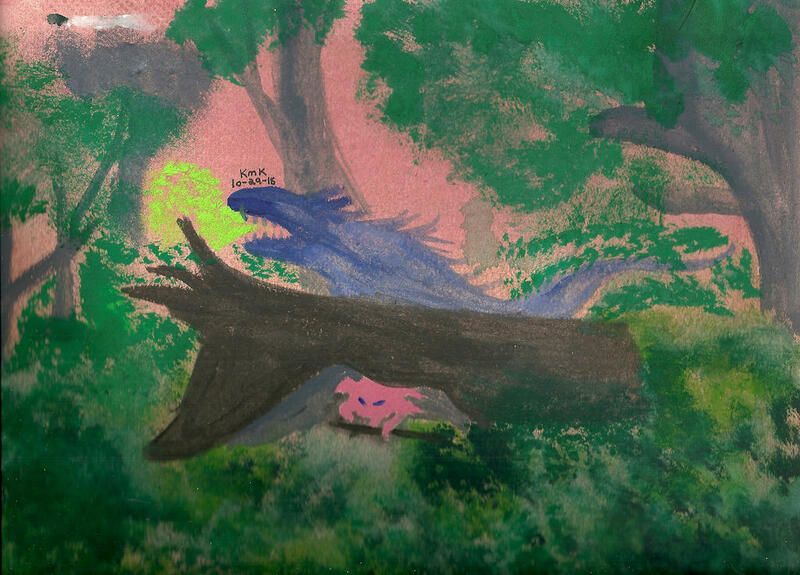 This is linked to my deviantART because I'm not sure if it's okay for the forum (mostly for blood? ), plus there's a story attached. I'll link this one too, since I'm not sure what the consensus on some of the material is here either. It's the point where I switched Obligado's color. This is more recent, and more exploration of his childhood. It's based on what I could grasp on how Obligado was remembering his parents. He was wistful seeing his mother and laughing when seeing his father. So from there, I'm thinking that his mother was comforting and his father was "fun". Father encouraged his exploration and let him do whatever; his mother knew it was useless to interfere and stop them, so she tried to advise caution. If things turned out bad, she would step in, fix up scratches, and confirm that he learned his lesson. And finally, totally not involved with Valentines tomorrow, another snapshot of one of his adventures with Nalmar...who I've considered at this point to be about 6-10 years younger than him. Young enough to be one of his students or a novice instructor, but not young enough to be mistaken for his being his daughter. 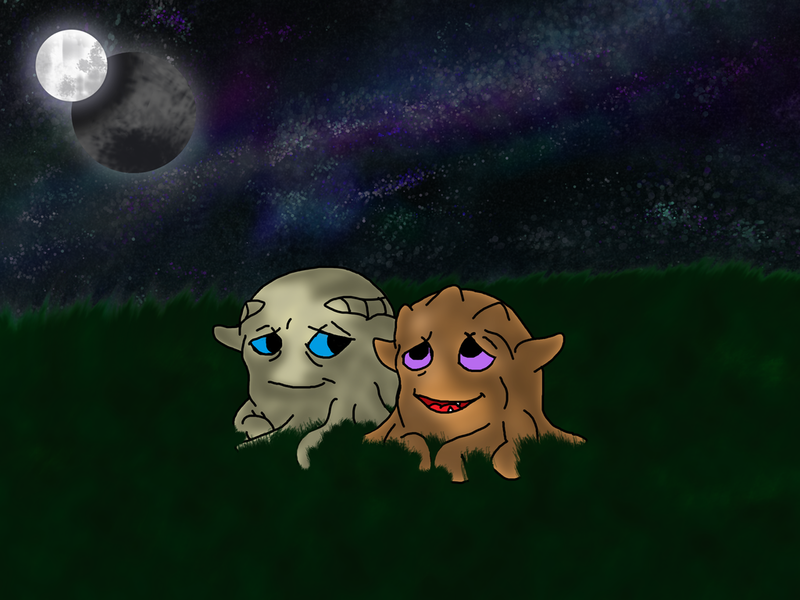 During one of their expeditions on a two-mooned planet, they stopped to enjoy the sky...and have most likely gotten really, really high. Nalmar in particular, the hippie that she is. That's about it for now; I might do some redraws and load them here at some point. I like the way they sink into the grass. Neato. Thanks! I'm really proud of it. I actually struggled with getting that effect...and then I learned how to use layer masks XD. This is certainly the best Temre has ever looked, and I've definitely gotten a better grasp on her scar. If Peter Laird can have those mutant Venezuelan raptors talk like Gollum, I can give homage the "hide from the Wraiths under the tree" scene. That has immediately followed an Indiana Jones situation. Last edited by Utrommaniac; 03-09-2016 at 08:35 PM. I made a plush Utrom a while ago. He's not totally done yet, needing eyelids and some kind of scalp ornamentation, but he's about as done as he can get. 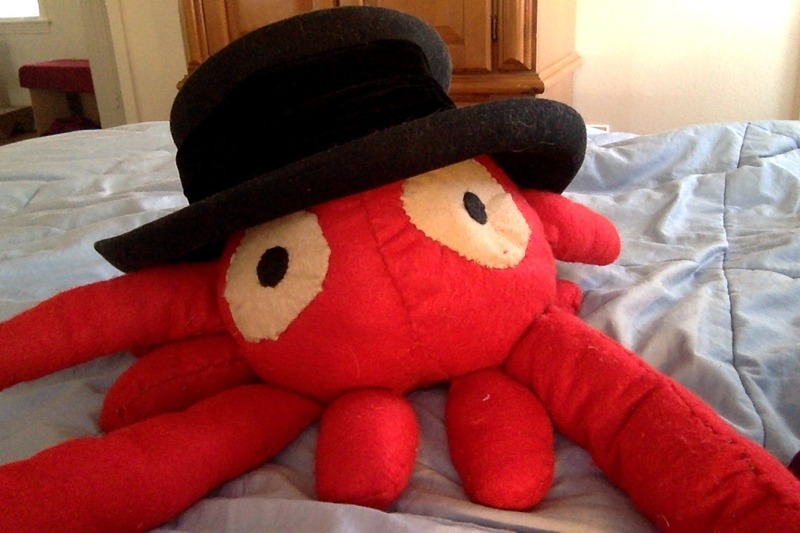 That hat is sort of his thing now. I don't know what kind of hat it is, though. I'm very happy with him, myself. In a change of pace, here's my idea of what 87 Shredder's mother looked like while he was a child. I definitely want to draw her more now. Now that #56 has shown what Utrom bedding looks like, I took the liberty of re-doing something I did about five months ago. I'm not sure if this counts as OCD or not, but Temre has a ritual where she has to report entries in several journals before going to sleep, otherwise she simply can't settle down. Sometimes it can be a test to Quanin's patience, and from the looks of her tea, she'll be there for a long while.